As timeless and feminine as a little black dress, Guerlain La Petite Robe Noir (Little Black Dress) Eau de Parfum is the epitome of couture for the skin. The romantic signature essence marries the finesse of Guerlain’s fragrance heritage with an irresistible, mischievous sense of femininity. A cheeky wink of Guerlinade sweetness and seduction that makes for the ultimate temptation. In the top notes of the Guerlain La Petite Robe Noir scent, ripe black cherry and berries meet with the exquisite creaminess of almond. This delicious sweetness is made more voluptuous with a heart of velvety rose, before the shadowy temptation of liquorice and aromatic black tea hint at an enigmatic intensity. 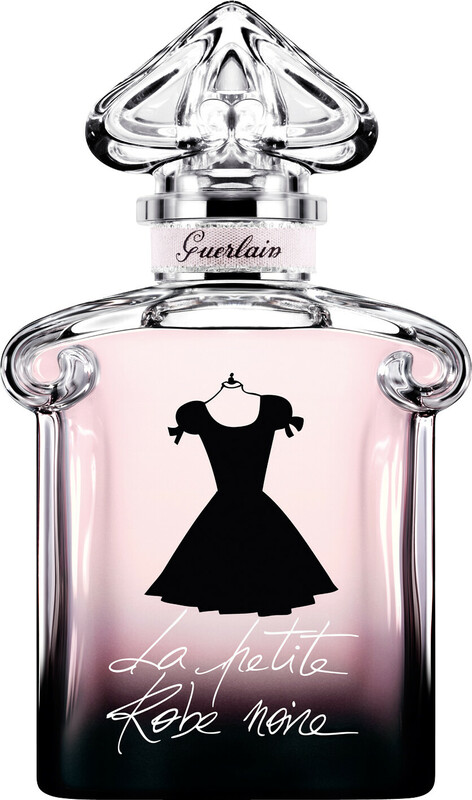 GUERLAIN La Petite Robe Noire Eau de Parfum Spray is rated 4.8 out of 5 by 25. Rated 5 out of 5 by Veroniche from My signature I fell in love with this "Little Black Dress" the first time I smelled it. It may be for my craving for the cherries, but the whole composition has an ultimate appeal to me. It also received beautiful complimenst from other women. I do not get Liquorice or Patchuli (luckily for me). I smell Cherries and berries and almonds and beautiful rose and sweet almond creaminess. Cherries are ripe and juicy at the top when sprayed (because of bergamot) and they quickly dry as if in the fruity tea. The composition is sweet but alluring. There may also be a hint of the black smoky Lapsang on my skin. I also have a 30ml body lotion and I am a big fan and collector of everything featuring La Petite Robe Noire. Rated 5 out of 5 by Jennie95 from Adorable perfume! I received a sample of this perfume and I fell in love with it. I decided to buy a 100ml bottle and wear it almost everyday. To be honest, it is a bit different with the sample I received (I think the sample is eau de toilette and I bought the eau de parfum) but I still love it. I am very happy because at least 2 times, someone asked me what perfume that I were wearing. I would recommend it to anyone. Rated 5 out of 5 by Emmahh from Asorable as.. Adorable as the clasic little black dress.and like the little dress La petite robe Noir is perfect for any time of day or occassion. Beautiful and leaving a gossamer trail that attracts looks and perhaps a comment or two too!Like the gentleman behind me at the "hole in the wall" who asked it name ..For his wife ..*laughs* not a chat up. Wearing it justifiably brings an exquisite version of the feel good factor What can I say ,but that you will never regret the purchase of this fragrance. Rated 5 out of 5 by Rainbow from Black Cherry Black Cherries have always been my Favourite Fruit. And La Petite Robe Noire Eau de Parfum is all about Black Cherry. Fresh Black Cherries - Cherry Liqueur - Fizzy Cherry Coke! Rose, Tea and Pipe Tobacco are also detectable at times. But... La Petite Robe Noire is mostly about the Magic Black Cherry! Love It!